HEMA is an independent non-profit representative organisation, the function of which is to support it’s members in the study and development of Historical European Martial Arts, and to promote and educate the public in Historical European Martial Arts on the island of Ireland, both within the Republic of Ireland and Northern Ireland. We have been founded so as to create a body that will assist HEMA clubs new and established in Ireland. We provide a network though which various clubs can connect as well as providing a common insurance policy for all member clubs. Through the engagement of our member clubs we strive to provide a forum to facilitate research, communication, technical instruction and safety between various member groups within the organisation, with the goal of improving the standard of Historical European Martial Arts on the island of Ireland. Rather than an interview this time around, we have some thoughts on applying new techniques in sparring from Matthew Malcolm, head instructor up at Medieval Combat Group in Belfast. For those who don’t know Matt, he’s been training in Early Liechtenauer longsword for around six years now, competed in SWASH and Fightcamp back in 2012/2013, taught at the inaugural Féile na Gaiscígh, and took League Champion in the 2016 Irish Historical Fencing League. His main interest and focus within HEMA is technical interpretation and application. This is far from a definitive discussion, or some guidance from an ancient philosophical master, but it is a short discussion piece on some of the issues that I have faced with my sparring, and how I have guided my technical improvement. Hopefully you’ll find some of the issues familiar and the discussion will be of help. Not covered in this article is escalation of intent; with exercises progressing from a slow drill environment to a high intensity tournament setting (an article in and of itself); due to this being about a specific single aspect. Technical sparring to me means using the right technique at the right time, with good form. You don’t just do a technique; you apply a technique to a specific set of circumstances and you need to get to the point where you can consciously, or sub-consciously, apply a technique at the right time. The only way to do this is to practice it, then practice is some more. It is advisable to practice slow, building up to sparring speed, introducing choices for each person in the drill, and so on, but that is a broader subject than this article will cover. So you’re a beginner, you’ve been practicing for a few months and you love sparring. It’s a rush, you get all hyped up and excited but as soon as you go start fencing it’s all a blur. This may sound familiar, and certainly this was the same for me. However when you do this you forget what you’ve learnt and you can’t make any techniques work! There’s a long term expectation that you will eventually get used to sparring, and it will appear to ‘slow down’. You won’t get the same adrenaline rush, but you will be able to think much more clearly, and this will not only allow you to be in much better control of the engagement but you will also find it easier to think consciously about technique. As in all things, preparation is the key. You need to acknowledge that when you start to spar all but the most deep-set and fundamental conscious thought goes out the window. So you need to prepare what you are going to do so you can stay focussed and remind yourself of your aim. Set yourself a goal for your sparring session; and I don’t mean, ”Today I’m going to win more”. That’s not helpful. The basic form of the technique; body mechanics, blade mechanics etc. The stimulus for the technique: what you should use it against, the position of the opposing blade and fencer, their intentions. The concept of the technique and what it aims to do. The timing of the technique; exactly when to apply it to the stimulus. The execution of the technique; how much pressure, the precise blade placement, and the control of the opposing blade. Lastly, the precise structure and form of the technique; like point 1 but honed. You don’t need to know all of these, as some of these will only be learnt through practice, but you need to at least know the basic form and the stimulus. The rest can follow as you improve. I’ll talk you through my interpretation of one technique to give you an idea of how I approach this; let’s take the Schielhau. Firstly I practice the cut lots so that I am consciously and subconsciously aware of the cut; this is my basic form (point 1). You can either learn this in class with your instructor or read the sources. Next I look at the applications: against an oberhau, against plough, against a thrust; and now I pick one. So let’s take against an oberhau. I think about when I am going to apply it: when someone lifts up into Vom Tag to strike from their right shoulder I will strike the shielhau and try to strike them on the head; this is the stimulus for the technique (point 2). Now in the days leading up to fencing I visualise the strike; before I go to sleep, when I am commuting to work, day dreaming etc. I think about what position the opposing fencer is likely to be in, how they will strike, what angle they will strike and how I am going to respond. I also think about what I am to achieve with this technique; the concept (point 3). I aim to close the upper left line of the oncoming cut, be in blade contact with their blade while I strike them on the head. During fencing I exercise discipline in sparring; I don’t spar to try and win, I spar because it’s an excellent ‘live’ setting to train techniques. In each sparring bout I forego all other openings in favour of practicing this one technique. I keep distance from my opponent, parrying if needed to stay safe, but wait for the correct position to apply this technique. In this way through my successes and failures I will learn timing and execution (3&5) of the technique; varying the timing, blade placement, footwork etc. with each attempt to find an optimal use. I am not concerned about failure; rather a failure gives me important information to calibrate my next attempt. As I practice I cement the stimulus and execution of this technique in my mind and make it more likely for me to remember in subsequent sparring sessions. The structure and form of the technique comes through time as my body learns what position is optimal for this technique and I execute it many, many times. This is refined and informed by non-sparring drills between sparring sessions. It still isn’t perfect; but it is much more useful now that it has been practiced at length. Matt launching a Schielhau at the Galway HEMA Open 2016. This process may seem complex, but this is basically how to conduct an experiment. Plan what you want to test, test it in the environment you intend to use it, change elements of the execution (variables such as angle, power, timing, distance etc.) to measure its success in response to the same stimulus, use the information you receive to inform subsequent tests of execution, and amend the execution to yield a better outcome. It’s important to keep an open mind; just because someone you respect says something is a particular way doesn’t mean that they are right, or that it will not work differently for you. Technical fencing is hard. 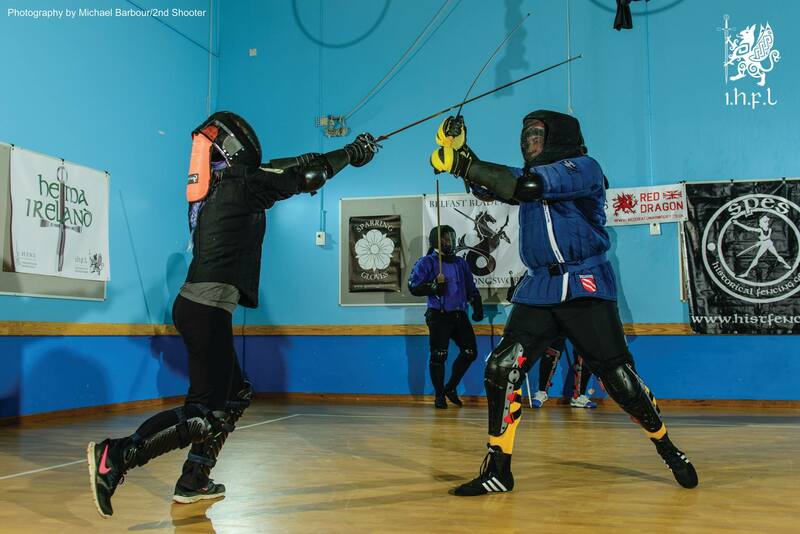 It takes a while to get it to a useable standard; and you’re going to have a tough time applying it both to beginners and to experienced fencers, especially in the high speed high pressure environment of sparring. Under the pressure of sparring, a lot of beginners just randomly roll dice in their head; improvising their response in a non-structured and erratic fashion. They won’t realise the threat you supply to them and do something that is ‘stupid’; resulting in doubles. An experienced fencer will quickly see you try to apply a technique they know, maybe they know the counter too, and will at least know how to avoid it. Both of these circumstances mean there is a clear intermediate plateau; where it just feels like you’re getting worse. You don’t get the same number of hits on beginners because you are now aware of the threats they pose and are more reluctant to attack, and you don’t get hits on people better than you because they can read you too easily. The way to overcome this is to give yourself time and continue to train consistently. The more you plan your individual techniques in isolation the better they will become. Get a good training partner, with consistent technique, who shares your desire for technical improvement. You will have another eye to cast over your technique, that you can bounce ideas off, and so you can inform them exactly what stimulus to give to you. Consistency of stimulus will mean your experiment suffers from less variation outside of your control; allowing you to focus strictly on your execution. This is a reason that training with your instructor is a much more valuable experience; but they will always be short on time. Even though you go to classes and get tuition your improvement is up to you. Plan areas that you want to work on, and talk to your instructor about these and get their input. Instructors should be interested in the development of their students and should try to give useful assistance. For example this article is written in response to a conversation with a student; I realised I hadn’t documented my method for improving my technical ability. The most valuable things in life are not free, and the price you pay for this improvement is time and effort; but it is ultimately worth it if you want to improve your fencing. The same methodology can be applied to competitive fencing techniques; or rather than using a new technique, to improving an existing one. I hope this was an interesting insight into how I approach this aspect of technical improvement and feel free to ask for any clarification. With the 2017 run of the Irish Historical Fencing League kicking off this weekend, we thought we’d take a look back at the 2016 League with a quick chat with Helen Gallagher about her experiences competing last year. As a bit of an introduction, Helen has been active in the Irish HEMA scene for a couple of years now. 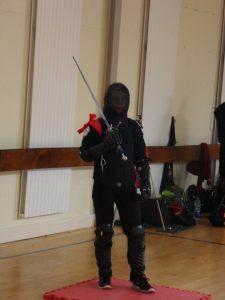 She was awarded the Accolade at fechtschule at Belfast Bladeworks 2015 by vote of the other competing fencers, and has competed in almost every HEMA Ireland longsword tournament over the past few years. She’s also responsible for the awesome logo for the Irish Historical Fencing League. Helen, you competed in the Irish Historical Fencing League last year and placed 6th out of thirty fencers, well done! How did you feel about your finishing place? I was a bit surprised to be honest! There were a lot of excellent fencers who took part last year so to place 6th amongst them was pretty amazing. Given that the HEMA community in Ireland, and the tournament scene especially, is quite young, how do you feel the refereeing and general calling of hits has been progressing throughout the League? Overall I think the refereeing and calling of hits was very good and progressed nicely across the League. It’s definitely not an easy task and as with anything it takes practice so I think the League was great in allowing people gain more experience in refereeing / calling hits. As you said it’s still quite a young scene so it will only improve as time goes on. How do you feel if a call goes against you? How do you deal with it? It happens, I just forget about it and move on to the next exchange! Of course when I first started competing it could get frustrating especially if a fight was close but I quickly realised how difficult it is for referees to see everything that’s going on. These things also tend to balance themselves out, I might get a call against me but in the next fight I could get one called for me. Or as was often the case in the League, people would acknowledge a hit on themselves if the referees didn’t see it – often forfeiting their own points. For me that creates a more positive and honest competition and makes it very difficult to get annoyed about a call not going your way. Definitely more a case of ‘Who am I fighting next’. When I trained in Galway I was the only woman there at the time so I’m used to fighting against guys. The way I approach it is that everyone has their advantages and disadvantages and you just have to work towards your own strengths. I’ve fought women who were taller and stronger than me and also fought men who were the same size as me so I just treat every fight on an individual basis. I think another important thing is that I trust all of the people I fought against. I know they’re all competent fencers who will do their best not to endanger me or anyone else whether it be a man or a woman. It would be brilliant to see more women take part in the future though, the more variety of people the better! Any plans to start competing outside Ireland? Any events or tournaments in particular that look interesting to you? It’s definitely something I would like to do in the future. I think I would like to be back regularly training before I actually took part myself though. Swordfish and the Nordic League are the events I’ve seen the most about recently and they both look really interesting. So hopefully someday soon! As I understand it, you’ve no HEMA club nearby that you can get to for regular training. How do you find competing and getting ready for tournaments, and events in general, because of this? Yeah that’s correct, it will soon be two years since I moved away from Galway where my previous club was and while there I had only trained for 18 months. Getting ready for tournaments and events has definitely been challenging. In the beginning, it was a bit frustrating, I was just so out of practice and not fencing as well as I knew I could. I would do some solo drilling before a tournament but it can only go so far in preparing you. Then at a tournament it would take me a couple of fights to get back into the swing of things which obviously isn’t ideal! 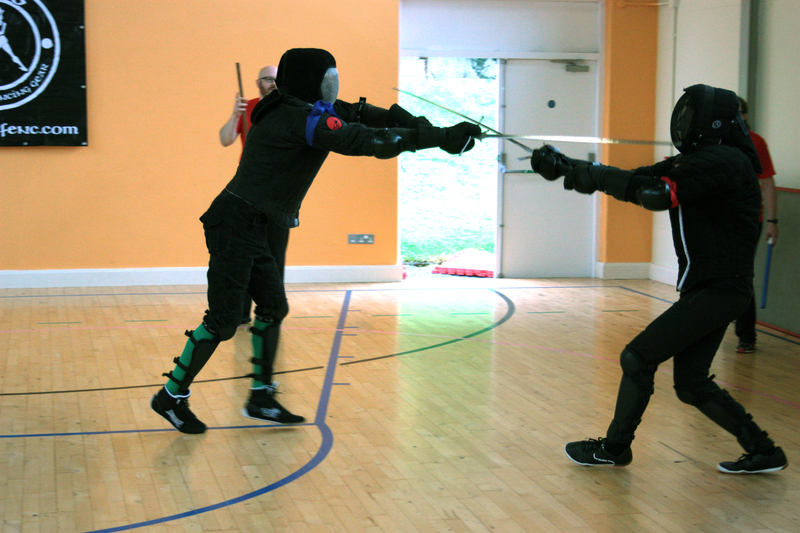 Essentially the Irish Historical Fencing League last year and other sparring days were the only chance I got to practice so I started treating them as just that – practice. I didn’t worry about winning or losing or that I hadn’t held a sword in a couple of weeks. Instead I started setting smaller goals for myself – for example picking a technique I rarely use and trying to execute it in the tournament or if I had lost to someone at one of the events try to do a bit better against them the next time. I think approaching it in this way was definitely very helpful for me as it stopped me worrying about how little I had trained and my perceived lack of progress because of that. Two years is a long time to be detached from a club, what kind of solo drills have you found to be useful over that span of time? I’ve really just tried to keep it simple and stick to the basics. I’m also restricted by the available space at my house and of course the weather! Nevertheless, I would usually just work through the Meyer cutting diagram, do some figure of eights, repeat the basic cuts and try to work on moving between different guards. I also at one point had a wooden post set up so I could practice distance and thrusting but that was in a different house with a much bigger garden – maybe something to look into again. Speaking of solo drills, have you done much cutting? Do you find it helps your HEMA in general? I’ve only tried cutting once but found it really helpful. It made me more aware of following through with cuts, edge alignment and also when it was done correctly how much more fluid everything felt. Definitely something I would like to try more of. What kind of routine works for you in training? Do you learn more from drilling or sparring? For me I think I definitely absorb more from drilling, I tend to just keep drilling a technique repeatedly until I feel I have it correct then when I’m comfortable with that move on to some slow sparring and try to work it in. Building it up slowly like that seems to work better for me as it becomes more instinctive when I move on to full speed sparring. Do you read any of the longsword sources to supplement your solo training? Do you find it helps at all? I think this is the area I feel I’ve missed out on the most from being away from a club. I find it hard to absorb and visualise the information from the sources when I don’t have anywhere to go and put what I’m reading into practice. Unfortunately I haven’t yet found a way that works for me in a solo training environment but I try to keep up with whatever I can. How did you get in to HEMA, what attracted you to it? I got into it by pure chance really. I had recently moved to Galway and was just looking for something to fill my free time so looked up various groups around the area. I’d never even heard of HEMA but saw a class was starting the following week and swordfighting was mentioned so I showed up out of curiosity and have stuck with it since. I’d always had an interest in history so that side of it appealed to me, I actually didn’t expect to enjoy the sparring side of it at all, I’ve never been competitive and have no background in martial arts but once I tried it I loved it! Any particular favourite weapon? Or one that you’d like to do more of? Longsword is what I’m most familiar with and I really enjoy it. It just immediately clicked when I started using it and I never seem to get tired of it. I’d like to try more sword and buckler or even rapier and dagger just because they would be a very different challenge to longsword.